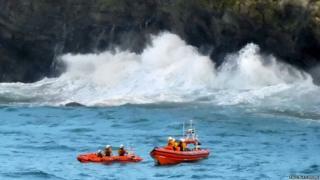 Six separate sea deaths have prompted a plea from the RNLI to the public to have respect for the power of nature. The deaths, in Cornwall, Essex, Dorset, Jersey and Aberdeenshire were directly linked to stormy conditions around coastal areas. The RNLI described the sea as "dangerously unpredictable". A two-year-old girl who was swept into the sea off Newquay remains in a critical condition in Bristol Children's Hospital. Mckayla Bruynius was with her parents and brothers when they were knocked off rocks at South Fistral beach on Friday evening. Her brothers managed to get back on to the rocks. while her mother, Lisinda was rescued by an RNLI sea scooter. They were all treated in hospital for minor injuries. After being rescued by the Newquay lifeboat, the toddler and her father were airlifted to the Royal Cornwall Hospital in Truro, where Rudy Bruynius, who was in his 30s and originally from South Africa, was pronounced dead. The family, who come from Morden in the south London borough of Merton, were on holiday in Newquay when the accident happened. An appeal to help the Bruynius family has raised more than £25,000 in two days. "The sea may look appealing and the RNLI would encourage people to use it, but do so safely - it can be dangerously unpredictable," an RNLI spokesperson said. The charity has urged people to use beaches protected by lifeguards and to swim between the "safe zone" red and yellow flags. It added that lifeguards were always happy to advise of any risks, including rip currents, which could catch out "even the most experienced swimmers".